Have you ever thought to yourself, "I can't go fishing, I don't have a boat" or "how can I thank my client," or even, "I want to take my kids fishing to see if they would enjoy it, but I don't have the skills to teach them." Call Tom Gravley with Lewisville Catfish Guide Service and tell him what your interests are and he will get you scheduled with a half-day, full-day, night trip, instructional trip, or even a trophy trip at one of the local area lakes. 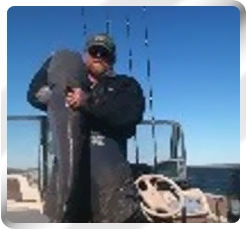 We specialize in blue catfish, channel catfish, flathead catfish, sand bass, and hybrid sand bass. To see pictures of our most recent trip, visit our Facebook page. Tom Gravley is a long-time fisherman. When he was a young boy, his Pop would go seining for minnows in the Red River to make their own stink bait, which was (and probably still is) a well-known bait in the Hardeman County-Quanah, Texas area. Pop had his own special chair that he would set up on the shore of the Red River and would fish with cane poles. His mother, Linda, and father, Lee, would take Tom and his brother, Keith, on trips to different lakes and they would fish and swim and have all kinds of fun. As an adult, Tom made his living by remodeling homes. Something that he is very good at. He currently owns and operates Gravley Construction in Highland Village,Texas. One day, he met someone that took the time to show him how to really fish for catfish. After that, he was hooked. He learned everything that he could about blues, channels, flatheads, sand bass, and hybrid sand bass. Tom fished in several tournaments all around the Metroplex and did well. His main interest with becoming a guide is that he wants to make sure that the children of his generation don't forget how to fish. He makes a point of teaching as many kids as he can that this is something that is fun and rewarding. If you are interested in booking a trip with Lewisville Catfish Guide Service, please complete the Contact form and Captain Tom will contact you for scheduling availability. He will do his best to make sure that you have a fun and memorable trip, so be sure to bring your digital or video camera to record these wonderful memories.